The Rooster is the tenth animal of the duodecimal signs of the Chinese Zodiac. Regarded as God’s ambassador, the Rooster has served to be an important part in human lives. Back in time, when there were no alarm clocks, the Rooster knew when the dawn arrived and announced it for the people in its own way. The qualities of the Chinese Rooster are imbibed by the people who are born in the Chinese Year of the Rooster. Such people are social and get along well easily with others. Rooster people are punctual and expect others to be punctual as well. Roosters have a sense of pride that they do not let down at any cost. They are independent beings and do not get carried away easily. They are ambitious and work hard to achieve their goals. On the flip-side, they are impatient and expect to get the fruits of labour right after making efforts. Rooster people are good at communication. The way the speak is known to win hearts and battles. They may be selfish at times because they consider their goals and ambitions more important than anything else. They are really quick-witted and never fail to leave an impressive imprint with their wit and sarcasm. Because Roosters like to do their tasks in a proper manner, they criticise things and people who do not do things their way. They think highly of themselves and are known to be their own admirers. You are a Rooster native if you are born in any of these years - 1921, 1933, 1945, 1957, 1969, 1981, 1993, 2005, and 2017. The Year of the Pig will bring about a positive change in the life of Rooster. Mostly, the changes will be observed in the financial life. The depleted bank accounts of the Rooster will be replenished. The scars of the past will make you much stronger and you will be able to move on from the things that are detrimental to your growth and development. 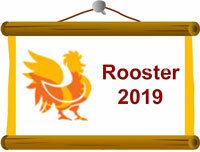 Chinese Horoscope 2019 predictions say that people born in the Year of the Rooster will be the master of their own destiny. You will be amazed to discover what the stars have in their kitties for you. Coupled with your luck, a strategy will be required to make sure that you get what you aim for. The Rooster people must realise that confidence is a necessity but overconfidence is a hindrance in your way to success. Believe in yourself and learn to reconsider your plans and discover your weak areas. Self-explorating yourself in 2019 will help you to unleash your hidden potential and pave your way to success. Roosters will miss golden opportunities if they are over-critical and let them slip off their fingers. A bit of patience will help the Roosters to get the desired outcomes. A major change is on cards for you. You may plan to switch your job, shift to a new place or lay the cornerstone of something new as a result. Be careful and make your decisions wisely, so you do not have to regret them later. The graph of your career will skyrocket during the Year of the Pig. You will be bestowed with the skills to tackle any problem that comes your way. Rooster people may face some difficulties in cooperating with their colleagues in the initial phase of the year but as the time progresses, you will find your colleagues singing song of praises for you. The Rooster will be able to save money for future. As a result, the Rooster will be well off when the new cycle of the Chinese Zodiac begins. Rooster people will be able to bag a promotion or hike in salary if they do well in their career. It is important that you adhere to your work ethics and morals if you don't want to face any problem in your career. You will get good chances to shape up your career. Without pondering much, you should utilize such opportunities that come your way. A career related to arts and literature is likely to get you good gains. You will earn more than last year. On the other hand, it is advisable that you should spend your pennies well. While your income rises, your expenses should remain static. This is how Roosters will be able to save money for the future. The Rooster people will have magnetic communication skills during the Year of the Pig. As a result, people will be attracted to them. During 2019, the people born in the Year of the Rooster will be able to influence others easily and win their approval. Rooster people will sow the seeds of many new friendships, some of which will play a major role in Rooster’s life ahead. You will spend time with your family and friends, which will brighten up your mood whenever you feel low. Rooster people will be able to do well in the society and adhere to the social norms. They will be known for their considerate behaviour. Avoid haste, otherwise, you may get entrapped in a whirlpool of problems. A Rooster is known to be smart enough to know people inside out. When dealing with people at your professional front, you must learn to be diplomatic. You may have to put up with some problematic situations at work. Few people that you are not a fan of will be a part of your professional life. It is better that you maintain the formal professional relationship with them instead of trying too hard to gel along with them. Also, being unfriendly to them and being uncomfortable in their company will do more bad than good to you, so you should stay away from doing so. Competitors will be jealous as always but you should be wary of them as they may pose threats for you. The single Rooster people may find themselves lucky in matters of love, as per Chinese Horoscope 2019 predictions. They may find someone whom their soul has been yearning for. Rooster people are suggested to reveal their true intentions and feelings to the people they are in love with, otherwise, they may end up losing their love. If you propose your loved one at the right time and in the appropriate manner, it is likely that your feelings will be reciprocated. Be honest with your emotions and do pour them out to the one you love. The Rooster people who are already in a love relationship should learn to respect their partner. Your nature of criticising your partner may create a rift between you two. As for you, you should learn to take criticism constructively. If your partner addresses any problem to you, you should try to fix it instead of being a backseat driver. Those who have got a heartbreak will be able to cope up with it. The wounds will heal, although the scars will take time to fade away. You will not be easily attracted to someone until and unless that person really clicks you. The Year of the Pig will clearly make you realise that this is not the end for you and you have got much more to do in your life rather than caring for someone who was not worth it. Marriage is not an easy affair and the Rooster people must realise that fact. There are ups and downs in every relationship and your marriage is no way an exception to it. Learn to deal with the problems of your married life. Communicating with your partner and learning to value their opinion is something that the Rooster people are good at forgetting. To have a blissful married life in 2019, you should cooperate with your partner. The relationship of the Rooster people with Ox people or Rooster people will be strong enough to withstand the problems. On the contrary, relationships with Rabbit, Horse or Dog will not be easy to handle. As per Chinese Horoscope 2019, people born in the Year of the Rooster are embedded with smartness, a trait which in reflected in whatever they do. During the Year of the Pig, the Rooster people may find it difficult to work along with other people. Indecisiveness and impatience might be the biggest root to the problems that the Rooster natives face. Roosters are proud of themselves and will not take orders from people who they do not find worthy enough. Also, Roosters will be jealous of other Roosters, creating an internal competitive feel amongst themselves. The flamboyant nature of Roosters will be evident by their lifestyle in the year 2019. The Roosters will have an economic bent of mind and will avoid spending unnecessarily. As a reason, they will not live a very luxurious life but they will be able to save for the long run. The people born in the Year of the Rooster will be able to get rid of the bad elements that have been affecting their health in the Year of the Dog. As the Year of the Pig kicks in, Roosters will find a drastic improvement in their health. The Rooster people will find the year encouraging enough to get rid of their addictions like smoking and drinking. If they do so, they will see a remarkable improvement in their health. Taking care of your health will be necessary, failing which you will have to suffer from the consequences. If you take proper diet and adhere to a regular exercise regime, you will be in a good health. Do not forget that mental peace is as important as physical health. Yoga and meditation will improve your health. For the Roosters, panic attacks and anxiety can be the reason for their health issues. In such a case, they must learn to deal with these problems. A stressed Rooster will not be able to put up with his own lifestyle and as a result, all the domains of his life will be affected. Therefore, it is important that you recharge yourself with enough sleep and keep your mind at peace to keep health issues at bay. There are risks of accidents and the people born in the Year of the Rooster are required to be careful of them. Avoid reckless driving and keep your speed in check. You should remember that you cannot risk your life for anything. There are chances that the health of a family member may degrade during this year. Hence, you will be required to take care of your kin as well. Rooster natives will be able to make the most out of this year if they are ready to give up their impatience. Performing their tasks in haste will lead them to nowhere. Greed should not be the sole driving force behind their hard work. Getting along with others will be much easier if the Roosters let go of their ego. The Year of the Dog has not been much favourable for the Rooster as the Dog is not a good friend of the Rooster. Now that the Year of the Pig brings an end to the Year of the Rooster, the Rooster natives can take a deep breath and go ahead with their plans. The months of April, May and June will be favourable for the Rooster. However, the a best time for the Rooster in the Year of the Pig will begin when the Month of the Ox (December 26, 2019 to January 24, 2020) kicks in. The month of March will be the least favourable period for the Rooster natives during which they need to be cautious. The birth of a child in the year of the Pig is good for Rooster parent if the other parent of the child is not a Rooster native. If a Rooster person wants to tie the sacred knot of marriage, they should avoid doing it in the Month of the Rabbit (March 6, 2019 to April 4, 2019). If planned tactfully, the Year of the Pig may bring about the most awaited changes in the life of the Roosters.